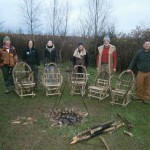 Anthony is running a stool making course on 20th/21st October. As before this is being offered at a variable rate depending on the number of participants- 6 places available. Weekend will cost £360, so if all six places taken each person pays £60. 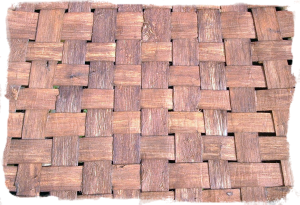 *NOTE: The Elm bark seat is not included in the above cost- This product is one we have had to buy in and costs £2.25/metre, so a 350mm² stool will use approx. 16m of bark strip- so £36. 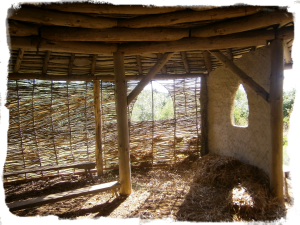 The Roundhouse is in process of having it’s wattle walls rendered with lime. This is a fascinating process and, although lime has a lot of mystery surrounding its use it is fairly straightforward if one applies a few basic principles. If you would like to come and have a go at applying some lime render we will supply all tools necessary and of course some guidance! We are planning to do this process in two stages- the first will be to finish the first (scratch) coat on 23rd-25th July, then the second will be the second (float) coat on the 13th-15th August. This is a process which is weather and progress dependant- please keep an eye on this Calendar for regular updates on this and other events. 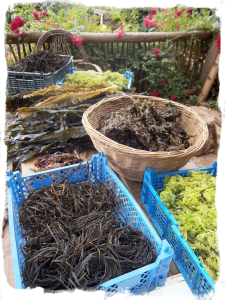 One of the annual food foraging highlights is a seaweed harvest. 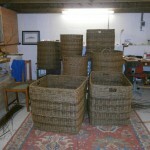 After rinsing then drying them they are all now safely stored for use over the coming year. Yummy! After having various bits of our kiln replaced we have just completed our first charcoal burn for many years. You may remember in an earlier post a mountain of sweet chestnut which we cut in the winter of 2016-17? This is the timber we have used for this burn. It took 6¾ hours from lighting to shut-down. For the first one in such a long time we are very happy with the results. So… we have 2.25Kg bags of top quality local sustainable hardwood charcoal for sale at £6/bag. Purchasing this charcoal helps support local coppice woodlands and all of the wildlife they support. Please contact us if you would like some. We also have loads of Ash or Alder or a mixed load of firewood for sale at £120/load. Place orders now to secure your load for the winter. We seem to be having a bit of trouble with our volunteers in that we can’t get them to leave! It’s looking like Tim will be staying with us for the foreseeable future (hurrah! ), Hannan, who came in January for 2 weeks has chosen to stay on as our intern until July (hurrah!) and Esme, who arrived a couple of weeks ago for 2 weeks has asked to stay until the end of May with the possibility of coming back as our 9-month intern later in the year. So great to have such a fabulous trio of caring, self-motivated and exceedingly useful volunteers and great to feel we’re able to offer them more through the internship. For more info see previous post. Last month’s course had to be postponed but is now rescheduled for 10th and 11th March. As before, cost will depend on how many places are taken up. Please see the Calendar for more information. Those who walk over here will have noticed an area next to the burial site in which we are clearing the brambles and the trees which have not flourished (with permission from the Forestry Commission). This is to become a Wild Flower Meadow burial site to complement the neighbouring woodland burial site. Ruth Wilson of the Growing Project in Pensilva took the first spot and was buried there early in January as part of a beautifully appropriate community-led celebration of her life. Jane Waters, Anthony’s Mum, was laid to rest next to Barry Waters last week in the woodland burial site snuggled in one of our Pentiddy wool shrouds. Jane was one of the founders of Pentiddy Woods and helped to secure the purchase of the land back in 2001. She has been a wonderful support through everything we’ve done here and was a much-loved woman. She will be missed by many. The burial site continues to thrive and we are constantly grateful for the opportunity to help people to build a better relationship with death – the only certainty in life. 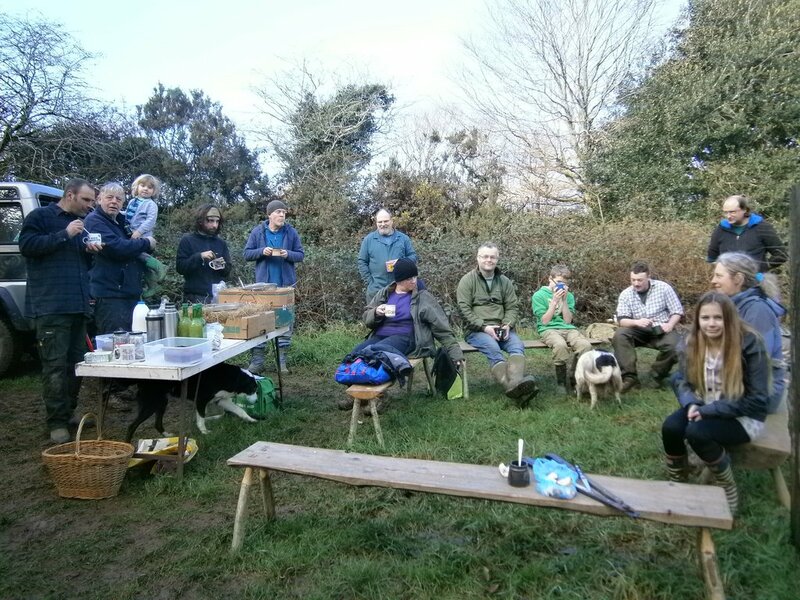 We had a very successful work day on the 14th January, with over 20 folk out to help us tidy the woodland, sned the trees that had been felled and bash the brambles back. A good time was had by all and we enjoyed soup and cake as well as good company. If you missed it – DON’T PANIC! 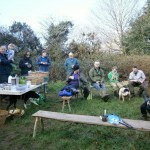 We have another work day booked in for 25th February and all are welcome to come and help support the woodland. Please contact us if you plan to come so we know how much cake to make! More info on the calendar. This might at first glance seem like an odd thing to include in our newsletter, but some of you will be aware that both Anthony and Adeon have been studying Ki-Aikido for some time and it has become integrated into all areas of their lives and has implications for them in their well-being, their general attitudes and their efficiency of work amongst a host of other benefits. Ki-Aikido has its origins in the Samurai warriors of Japan and is ostensibly a martial art, but it is also and foremost a fascinating study of the co-ordination of mind and body. It is dynamic, compelling and life-enhancing. Having studied for around 12years, Anthony is now a 1st Dan Black belt and Adeon after about 5years of study has a yellow belt with 2 orange stripes (stripes are junior intermediate levels). 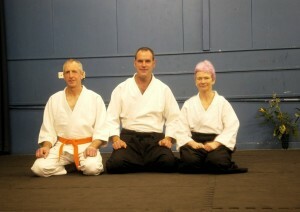 The school of which they are both members is headed by Sensei Stuart Stripling who has been teaching for around 23 years, the last 13 or so in Liskeard. This year though he has made the decision to change the way the school works and he will teach only the higher grade students. Anthony has been asked to step in and teach the Liskeard club from the 8th February. An exciting opportunity! The way the hierarchy works means he cannot teach the same grade or higher so he will only have four of the clubs’ original students. This means that beginners will be very much welcomed and encouraged to come and have a go and help support Sensei Anthony at his new dojo. Lessons will be in the hall at the Liskerret Centre every Thursday evening from 7.30-9.30pm. Please come along with loose fitting clothing and with short finger-nails and toe-nails. You will even get a lovely cup of tea half way through! Lessons are £5 (£3 under 16’s). Membership is £18/year payable on your second evening. For more information (and a slightly more eloquent description) of Ki-Aikido and more about the school please visit setsudo-ki-aikido.org or contact Anthony- anthony@pentiddy.co.uk or call him on 07765 103504, or simply turn up before 7.30pm on a Thursday. We’ve been having difficulty getting rid of volunteers recently. They plan to come for a week or 2 and end up staying! We have had a wonderful trio supporting us through the last few weeks, Tim, Hannan and Esme who will all be staying for the Spring and beyond. Unfortunately we’re a little short on accommodation as a result so would be interested to hear if anyone knows of a cheap (or cheaper!) caravan available. Our hope is to eventually build something more permanent, but for the time being a caravan is the best option. Please get in touch if you know of one up for grabs. Since the new year Ele has been working with 2 close friends Sara and Jess to fulfil a big basket order for a hotel in Reading. The order was placed through Sara’s business naturesparks but having just had a baby she called on Jess and Ele to help carry it out. It’s been a brilliant experience to work together on it and lots has been learnt. Ele has been asked to help run this year’s Nature Culture Regeneration Course on Dartmoor. Anthony, Tim, Hannan and Esme will also participate. Check it out if you’re interested in learning how to connect more fully with ourselves, with our natural environment and with each other to create more whole and effective communities. Click here for details on Facebook or here for the flier. Welcome to what will hopefully now become our monthly newsletter. Our aim here is to impart some useful information and share news and insights from all the sub-projects that make up Pentiddy. We hope the content will be insightful and informative. We have a huge amount of gratitude for being able to live here and steward this plot of land. Many who walk, attend events and learn here also have a love of the place. This newsletter is a means of celebrating everyone’s connection to Pentiddy. This is the time of year for all thoughts that have been brewing over the winter to awaken and start sprouting. Buds and ideas swell and bulbs and new ventures push up through the earth. It’s certainly had its effect on us! We’ve been enjoying our visits from the buzzard who perches on the same gate post daily to look for breakfast. we’ve also been treated to numerous breath-taking sunrises and the first taste of fresh wild salads. 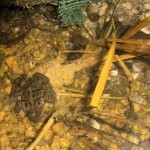 So we’ve started the process of changing our small wildlife pond into a natural swimming pond which is no small task! 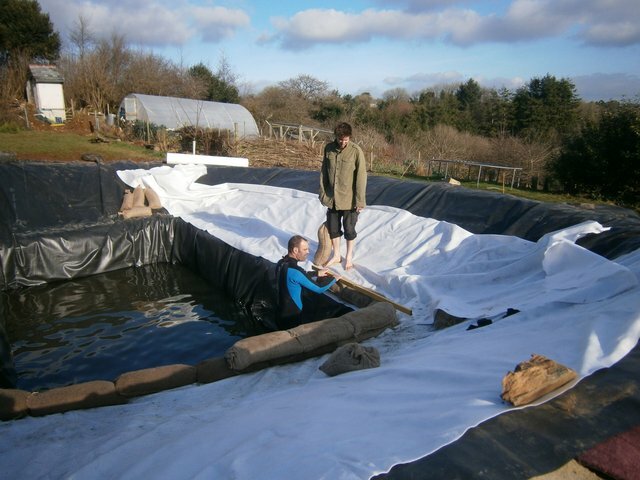 It’s been interesting work to carry out in the middle of winter as it has involved lots of mud, and wading in the pond in January to build the sand bag wall (which was not Anthony’s favourite job!). 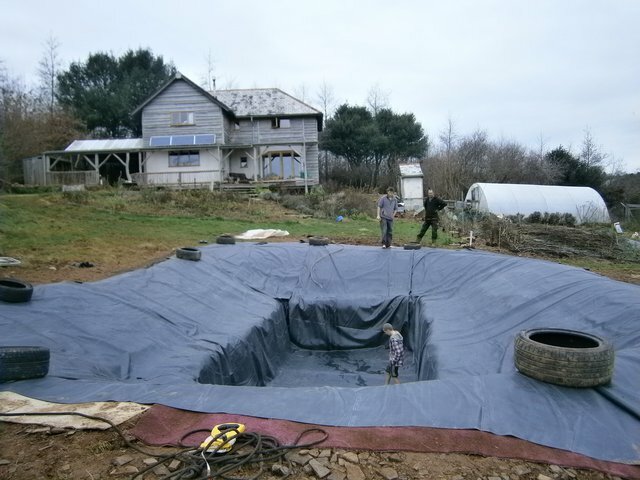 The principle of a natural swimming pond is simple enough- instead of chemicals to clean the water, oxygenating plants are used and nutrient levels kept as low as possible to inhibit algal growth. The planted zone has to be at least equal in area to the swimming zone, so we will still have a haven for wildlife. We’ll let you know how effective it is once it has been completed and the plants and biology have established properly. We have received planning permission to extend the burial site into the area to the south of the existing site where the previously planted Chestnuts have not thrived. This area was under our Woodland Creation Grant with the Forestry Commission who have agreed to us removing the trees and changing the use from forestry to burials. Because of the low fertility levels in this area we have decided it will work best as a wild flower meadow which also offers further choice for those being buried here and it increases the diversity of habitat. Following a meeting with local grassland expert Kevin Austin (Skyegrove) we now have a clearer plan in place for using the sheep to manage the grass in the early Spring and Autumn and cutting for hay in the summer. We have also sown a couple of areas of yellow rattle, a wild flower that is parasitic on grass and will assist in the creation of some wild flower glades for wildlife. 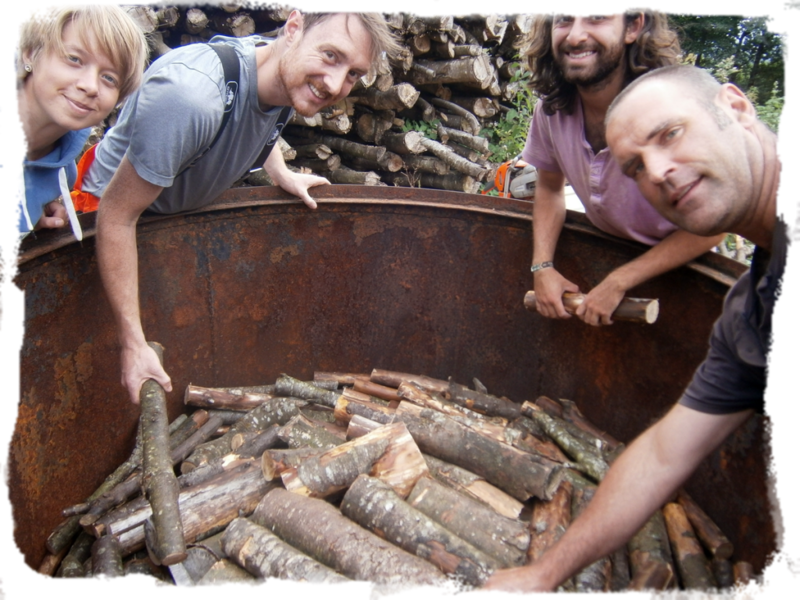 With the Burial site, the coppice and the skills base, we figured we should at least look into producing a sustainable coppice-based coffin. We’ve encouraged our basket-making friend Jessie Carr who lives here in Pensilva to have a go at making a willow coffin for our next burial here. She agreed to include some willow grown at Pentiddy which we’re hoping to supply to her in increasing amounts. The coffin she has produced is stunning. 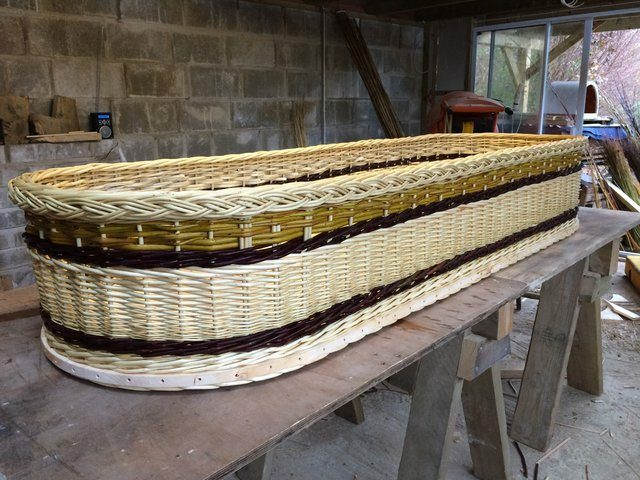 Back at Pentiddy’s workshop we’ve been busy thrashing out ideas for using Hazel for coffins for a quicker and therefore cheaper coffin and we’re also looking at developing shrouds with a hazel base. We’ll keep you posted on progress. 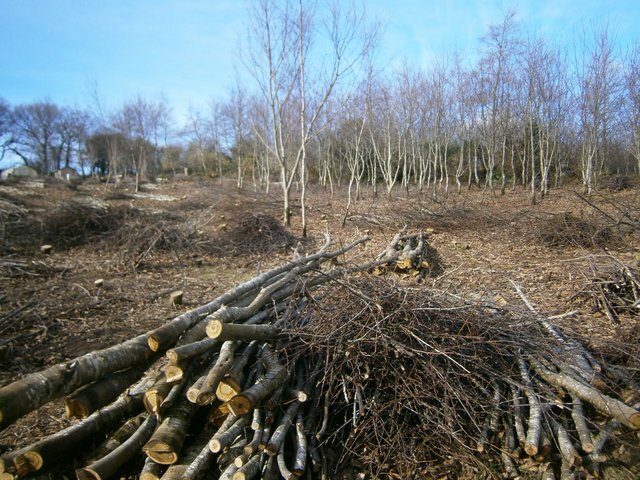 We have started the coppice cycle with a cut in the area of Sweet Chestnut above the house, and also a re-cut of the 3 year old Hazel. Although only a small area, the Hazel is of fantastic quality with pretty much all of the poles selling by word of mouth. It has gone for hedging stakes and binders, bale spikes for a straw bale build and of course bean poles. 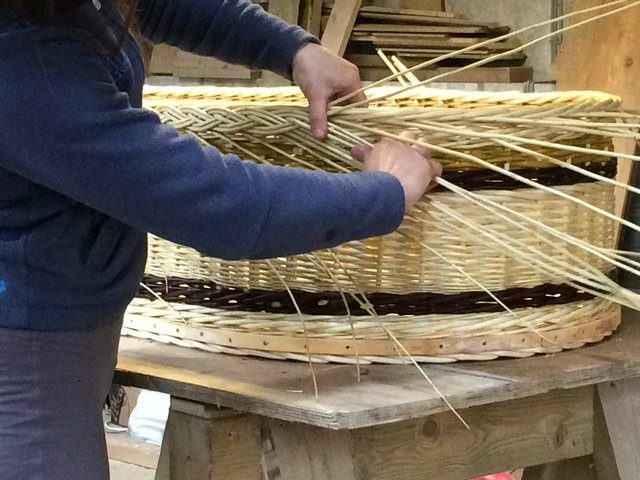 We have also supplied the Devon Rural Skills Trust with materials for their hurdle making course. As it is the first cut for the Chestnut there are not really any useful poles this time round but an awful lot of firewood! Tim is also experimenting with a kontiki kiln for making biochar with the brash tops. As part of our post-house process, the Heartwood Creations woodworking workshop is undergoing an overhaul with the anticipation of running a series of courses starting again this year. Materials salvaged from the demolition of the mobile home and left-over house build straw as insulation have created a dry store attached to the workshop so Anthony can have rust-free dry tools. Francis (who has the allotment here) has also donated her old kitchen cupboards for storage. He’s a very happy man! What’s even better is that he also has a whole list of things to make so he’ll be making very good use of the new space in the next few months. April the 8th will see us opening the site here to an event tied into the Small Woods Association national bean pole week. This is looking like it will be a fairly large event with a ‘local and sustainable’ theme – around 30 stalls showcasing businesses and individuals from the local area. there will also be talks, demonstrations and live entertainment. Put the date in your diaries. More information will be available in the next newsletter. The websites and content have had an overhaul and we now have a calendar of events which include courses run through Heartwood Creations, community work days for the Community Woodland and anticipated dates for sheep grazing and hay making in the burial site. We’re breaking ourselves in gently with courses this year offering only a few but we hope to be at full speed in 2018. Ele’s pursuing a Food Hygiene course so that we can include a home-produced lunch down at the house for course participants. Once again an apology for any spurious e-mails, and any odd things that have happened whilst things were tested, re-jigged and set-up. I am not a whizz with technology, just a little bit of a geek, and I hope that eventually my efforts will make the suite of Pentiddy websites an interesting, useful and informative resource…. Please pass on the link to our newsletter to anyone you think may be interested and encourage them to subscribe. Unsubscribing is also easy and is honoured- we are not into e-mail spam!